You are always welcome to my River Arts District studio in the artistic cultural city of Asheville, North Carolina. You will find me painting Tuesday through Saturday and the studio is open to the public for viewing 11-5pm and by appointment. I paint a dozen or so paintings a month, which always include several commission works, and I sell just as many. My website is updated weekly with new works. I am always happy to discuss revisiting a painting for a commission. I am often asked if I teach; I do not, as my painting production schedule does not permit it. My studio assistant, Katie Avant, is always available to assist with your acquisition of paintings I have for sale or in setting up, and an appointment for a commission. My other assistant is Rufus, who is alway ready to welcome you with his wagging tail as well as Peggie Sue. Of course, I am always available to talk with clients. 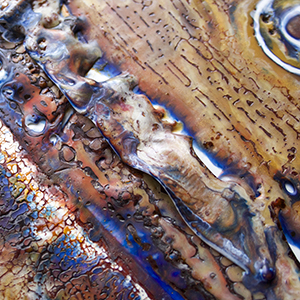 Encaustic is a process-driven art form: it can be dangerous, toxic, and expensive. The results can appear sculptural, like clay or glass or enamel, all mediums I love and can touch. It was only after I immersed myself in hand-building with clay, and then experimented with applying post-firing wax finishes in 2006, which then led me to paint with encaustic. The translucent fluid color, the tactile skin-like feel, and the many options for visual tension on the painting surface, as well as on the layers in-between, permitted me to use my sculpting skills and clay tools in a way I had never imagined. I paint exclusively with pure-color encaustic paint, only occasionally incorporating other mediums (less than one percent) for surface effects, such as shellac, gold or silver leaf, fiber material and even clay objects I have made.Totally self-taught and free to explore, I have developed my own unique techniques and identity, by treating the surface of my paintings as sculpture.